Musical Instruments for Early Music- Medieval, Renaissance, and Baroque European Classical Music. 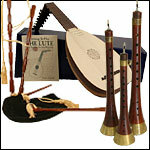 We sell Medieval Pipes, Bagpipes, Medieval Drums, Bodhran, Lutes Smallpipes, Electronic Bagpipes and Accessories. Instructional Music Materials- Instructional Books, CD's & DVD's for the new musician! Our Natural Drum Skins are Premium Natural Skins for drum head replacement. With or without hair, Natural opacity, sold in Flat round single pieces. Percussion- Agogos, Bells, Noisemakers, Rattles, & More! String Instruments - Early Music String Instruments, Lutes, Guitar Lutes, Balalaika, Accessories and Cases. Wind Instruments - Modern and Medieval Bagpipes, Flutes, Shawms, Bombards, Reeds and Accessories.